Colorado’s transportation system requires that automobiles weighing 3,000 pounds share the road with tractor-trailers and other large trucks weighing up to 80,000 pounds. Trucks lack the maneuverability, handling and stopping ability of cars. Trucking companies understand that their drivers must use extra caution to avoid accidents with automobiles. But theory and practice do not always coincide. 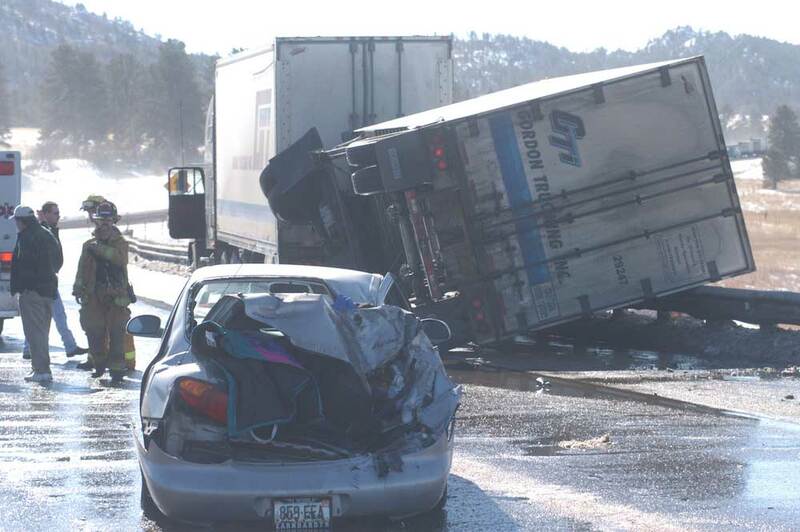 At Cederberg Law, Boulder Truck Accident Attorney Luke Cederberg represents people injured or killed in commercial truck accidents on Colorado roadways. Contact Cederberg Law at their office in Boulder, Colorado for a free consultation about your case. Trucking companies operate under deadlines and delivery schedules that become impossible if weather, road conditions, traffic conditions, accident delays or mechanical difficulties occur. Truck drivers are always in great demand because of high turnover, and many drivers are therefore inexperienced. Drivers often operate under a great deal of stress. They live in a world of truck stops and sleeper cabs. They are poorly paid and lose money if they are delayed. They often have family stress and are particularly vulnerable to job-related injuries and ailments. Many trucking companies monitor their drivers’ every movement through satellite tracking systems. Drivers are constantly prodded to remain on schedule. Pressure to remain on schedule can deprive drivers of required rest and prevent routine maintenance that affects vehicle safety. Records generated by these systems are typically preserved for only a short period of time. Early involvement of a lawyer working for you can result in preservation of these important records and build a better case on your behalf. Numerous federal safety regulations apply to truckers. These include required logs, mandatory rest periods, maximum permissible work hours, mandatory drug testing after a collision and other rules. Luke Cederberg will help you navigate the technical aspects of your accident claim. Common carriers, including bus companies and railroads that transport people for hire, are charged with the highest degree of care consistent with the practical operation of the vehicle. This higher standard can be important if injuries occur due to the operation of a bus, commercial passenger van or train. Luke Cederberg is a Boulder personal injury lawyer who understands the complexities that go into handling an accident claim following a commercial vehicle or truck accident. To learn how you can obtain monetary damages to compensate you after a serious accident, contact Cederberg Law or call 303-499-0449 to schedule a free consultation today.